 The original soup has flat noodles, but try some of the many fun shaped pastas (e.g. bow ties, corkscrews, wagon wheels; photo courtesy Good Eggs. 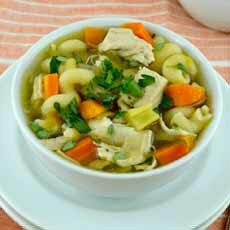 Turn soup into a meal by packing in the chicken, pasta and veg (here’s the recipe from Gotta Want Seconds). 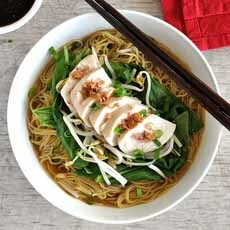 How about chicken noodle soup Asian-style, with ramen noodles and sliced chicken? You can use traditional American vegetables—celery, carrots, onions—and stock; or accent the stock with ginger, soy sauce, plus bok choy and napa cabbage (here’s the recipe from Recipe Tin Eats). Got glass mugs or Irish coffee glasses? Use them! (here’s the recipe from A Family Feast). For February 4th, National Homemade Soup Day, calls all of us to make a pot of soup. If you haven’t made homemade soup, you’ll be surprised at how easy it is—especially a broth-based soup. Just add the ingredients to a pot of water or stock, bring to a boil and simmer. That’s it in a nutshell (with details depending on individual recipes). We couldn’t decide which soup to make, so we turned to the numbers: America’s #1 favorite is chicken noodle soup. Our grandmother made this classic comfort soup from scratch with fine egg noodles (photo #4). Our mom preferred wide egg noodles. But why not have fun with it and use one of the many fun shapes: bowties, corkscrews, shells, wagon wheels, etc.? Herbs: Chopped or minced fresh herbs taste best, but sprinkle dried herbs—including garlic or onion chips—if that’s what you like. Spices: From black or colored peppercorns to red chili flakes—or maybe a dash of curry powder—check your spices for something that adds flavor and color. 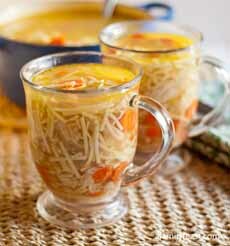 Raw vegetables: There are vegetables in the soup already, but a topping of crunchy matchsticks—carrots, celery, daikon, jicama—or scallion slices is a welcome addition. For color, add diced bell peppers—ideal a mix of red, green, orange and/or yellow. Bonus: More chicken—diced, pulled or sliced. Adding a mound of chicken to the center of the bowl turns the soup into a main meal. Plus: Better bread and crackers: Raisin semolina bread? Walnut bread? Flatbread? Breadsticks? Crisps? Pick an artisan bread or gourmet crackers. Or, serve crostini: toasted baguette slice spread with anything from “bruschetta topping” to pimento cheese. 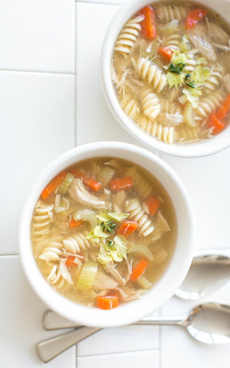 We make our chicken soup from scratch (here’s a recipe), but you can do it faster with a box of chicken stock and pre-cooked chicken breasts. We use lots of fresh dill and parsley in our stock, but some people prefer thyme. Pick one or two; or set out several and let each person customize his/her own bowl of soup. Chopped fresh chives and/or parsley. Sliced jalapeños or a sprinkle of red chile flakes. Chinese-style fried noodles or wonton strips (here’s an easy recipe) for homemade wonton strips. More chicken: pulled, sliced or diced. Here are garnishes for other types of soups. 2. COOK the noodles according to package instructions. While it cooks, dice, slice or shred/pull the cooked chicken. Taste and add salt and pepper to the stock as desired. 3. PLACE the drained, cooked pasta and the chicken in serving bowls. Ladle the stock and vegetables over them. Garnish as desired. Check out our Soup Glossary for the different types of soups to make.